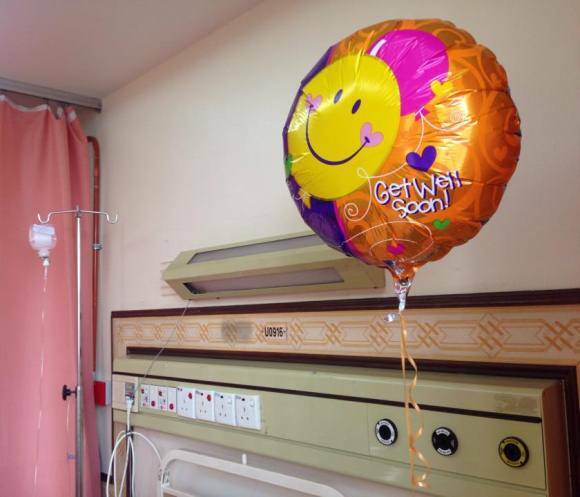 SeniorsAloud: SHALL WE SEND MOM TO A PRIVATE HOSPITAL OR A GOVT HOSPITAL? SHALL WE SEND MOM TO A PRIVATE HOSPITAL OR A GOVT HOSPITAL? When an elderly parent has a bad fall and requires immediate medical attention, what do you do? "Which hospital to send her?" You have little time to think of comparative costs, hospital's reputation, doctors on your contact list. etcetera. There is even less time to consult family members. costs - how much can you pay? What's your max? location - is the hospital close enough for daily visits? reputation - what have you heard about the medical expertise and nursing care? services - how efficient and integrated are the services? facilities - do the facilities meet your expectations of comfort, care and convenience? Surgery and hospital stay at a private hospital can swallow up a sizable portion of your retirement savings. If your elderly parents are in their 80s and 90s, they probably have no medical insurance. If you can afford it, or if your siblings are prepared to share the hefty bill, then by all means, opt for a private hospital. Otherwise, go with a government hospital. 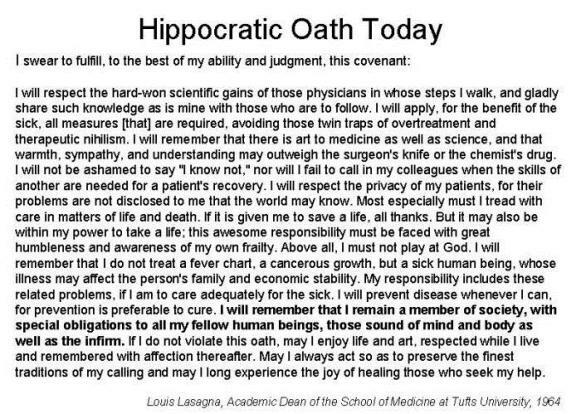 Whether they work in a private hospital or a government one, all medical doctors are commited to the Hippocratic Oath to treat, mend and heal patients entrusted to their care. Even in teaching hospitals, senior surgeons and professors are there to supervise and step in when the situation calls for their intervention. So there is really no need for concern in this aspect. If there is any difference, it is arguably in the quality of nursing care. Private hospital nurses are at your beck and call. They cater to your every need or demand. They have better bedside manners, are more gentle and patient, and make an attempt to get to know you as an individual. But it will cost you. Nothing is complimentary. Every service or item, no matter how small, is chargeable. Contrast that with the nurses in government hospitals, or at least in the one where my mom was admitted. The nurses behaved as if they were doing my mom a favour rather than providing a service. A couple of times my mom was busy with visitors and missed the diaper change when the nurses made their rounds. She had to wait till the next round which was hours away. When I asked for her diaper to be changed, the nurses showed their annoyance. On one occasion when I approached the nurse to change the bedsheet as my mom had wet it, she handed me a fresh bedsheet, expecting me to do it all by myself! These are 2009 prices. Expect to pay much more now with GST. See below for current fees. Government hospitals are heavily subsidized, so charges are a whole lot lower. 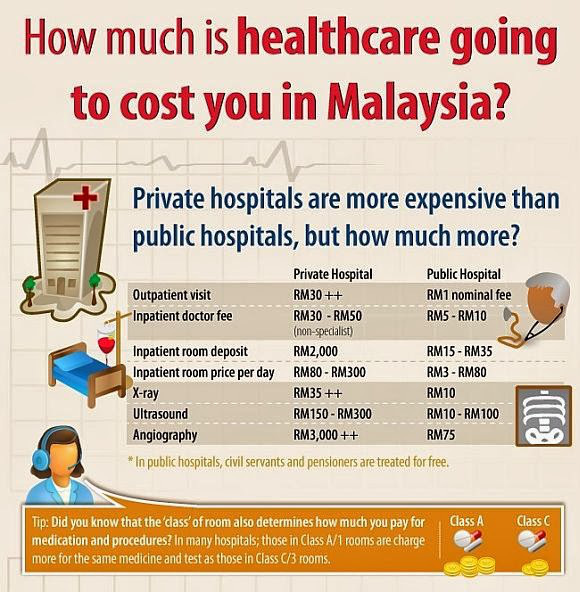 For comparison, in March 2011, when my mom was discharged after 15 days in a private hospital for hip surgery and angioplasty, the bill came to a whopping RM45,532.90. This excludes the charges for rehabilitation and medicine. The itemised bill came to several pages! Compare this with the costs incurred for my mom's recent 9-day stay in the orthopedic ward of a government teaching hospital. Irrespective of room-type, patients were charged RM70 a day. This covered breakfast, lunch, tea-time and dinner. You could select your meal from the daily menu. X-rays cost RM85 each, physiotherapy sessions RM20 each and doctor's (intern) consultation was Rm15. Add RM2120 for the PFNA device, and another couple of hundred for diapers, medicine, rubber gloves and other essential items, the grand total came to just under RM5000. An amendment to the 13th Schedule of the Private Healthcare Facilities and Services Act 1998 passed in Dec 2013 allows doctors in private clinics and hospitals to raise their fees. 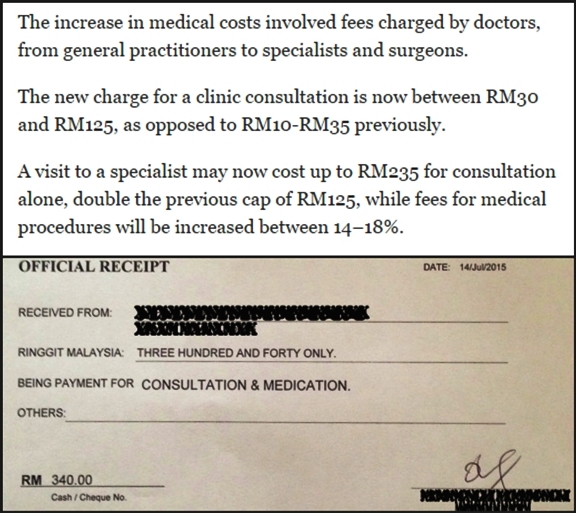 But as the official receipt above shows, some specialists can charge as much as RM340 or more for consultation and medicine. The majority of middle income wage earners can't afford the high cost of sending a loved one to a private hospital. They will have to opt for a public hospital and bear with the less than satisfactory nursing care, basic facilities, and long queues for consultation and for medicine. Invest in medical insurance for yourself and your family if you haven't done so yet. Pensioners and their spouse enjoy free medical treatment and hospitalization, or pay only a nominal fee. 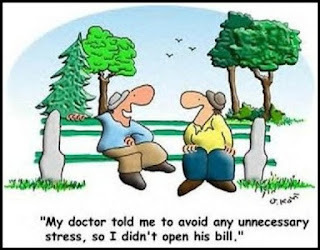 When you do your retirement planning, remember to factor in medical expenses for your elderly parents. Most financial planners don't mention this crucial allocation. How much you can afford to pay is more important than showing how filial you are. Filial piety is not measured in monetary terms. Your mom will recover from hip surgery whether it is done in a private hospital or a government hospital. Find out what you have to do to prevent falls in the elderly. My mom fell not once but several times, including two falls that required surgery and hospitalization. The first time she slipped and fell outside the bathroom. The second time she fell from her bed. Just bear in mind that despite the closest supervision and best preventive measures, accidents can and do happen. We can only reduce the risks. 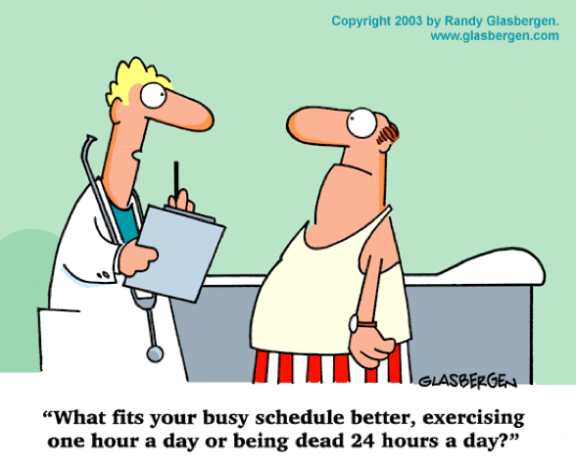 Take care of your health. Keep fit. Eat sensibly. No awareness campaign is as powerful as the harsh reality of seeing patients in ICU with tubes inserted in their body after heart surgery. Equally heartbreaking is to hear the cries and moans of the patients in the orthopedic ward after amputation. An elderly patient in the room next to my mom's lost both legs and an arm because of diabetes. The government's anti-smoking campaign requiring all cigarette packs to carry images of lung cancer has met with limited success. To quit, smokers need to face harsh reality, not 2D images, campaigns or exhortations. Admirable dedication. The effort you put in to inform your readers, your choice of illustrations, the clarity and readability of your posts, most impressive and laudable!